An 8 yard dumpster is the largest size we offer, making it the perfect fit for any business that has a large amount of trash. These dumpsters have 8 cubic yards of volume, providing ample storage for commercial enterprises. Dimensions: 6 feet x 6 feet x 7 feet. Weight Limit: Typically can store up to 1,600 pounds of material. An 8 yard dumpster has a huge amount of space, but we cannot accept any heavy materials such as concrete, asphalt, dirt or shingles. Additional prohibited items include hazardous materials such as medical waste, industrial drums, railroad ties, solvents and any flammable, corrosive or toxic items. 8 yard dumpsters are typically reserved for big companies that either have a lot of employees (in excess of 500 employees) or occupy a large commercial space of up to 25,000 square feet. 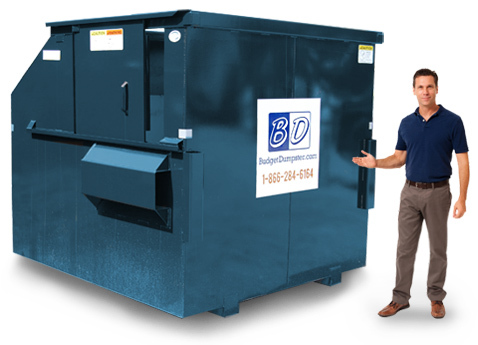 An 8 yard dumpster allows customers to handle their large waste streams on a weekly, biweekly, or monthly basis. If your company occasionally has bulky materials, such as small furniture or boxes of paper, they can all fit comfortable inside without resulting in an over-stuffed nightmare of a bin. Where Can I Place a 8 Yard Dumpster? Since the 8 yard dumpster is quite big, it needs a sufficient amount of space in order to be placed on-site. These bins will need an area that is 49 square feet in size due to its 6’ x 6’ base. But equal consideration must be made for the garbage truck that has to empty out the dumpster. The truck will need about 40 feet of clearance in front of the dumpster, as well as 16 feet of vertical clearance. This is to allow enough room for the truck to lift the bin over the cabin and deposit its contents into the pickup bed. Most large commercial spaces will have plenty of space for these dumpsters in the back area of their facility. But if you are uncertain about where exactly you should keep your 8 yard dumpster, just give us a call.